It’s rather refreshing to be able to write something that almost entirely dwells on the positive rather than the negative, not in a Roberto kind of way, but there were so many good things that happened yesterday, I’d rather talk about those than the obvious shortcomings that the ubiquitous Silva and his friends very nearly exposed. There is something wonderful about this image….. I must admit that my journey to Goodison from the humdrum midlands, beset as it was with wind problems (but enough about me…) was not exactly filled with confidence. Too many questions were in my mind…. b) How would the wind affect Robles, flappy at the best of times, and I’m sure a gust or two from the Irish Sea was only going to lead to less catching and more punching or dropping? c) Would the crumbs of comfort after the West Ham comeback be a taste of things to come or a reminder of what once was? d) How on earth would our leaky defence cope with a moving ball in the air when they haven’t coped with very much at all this season? e) And would Baines return and Stones continue alongside Wobbly Jags? Not too bad in answer to my questions in the end, but to be honest, I wasn’t expecting anything other than a heartening performance and very unlikely to see a point or three. One of my questions to myself was not ‘will we win or draw’ because frankly, I was fairly confident of defeat, though I hate to say it. As it happens, the point was what we deserved. City were all over us early on, with our 4-5-1 formation more often than not too far apart to offer enough solidity in defence. There were also these 3 lads, each called David Silva, each with the same appearance, each about 5ft 8in, each highly skilled technically and the way they interplayed was magnificent. It was almost like watching just one player of that name, running the whole show, and being absolutely everywhere, trying to unpick our defence. He was superb. But for all their fine approach play, typified by their ability to pass balls early and with the right weight (watch and learn Everton), their normally clinical finishing was missing. Navas had their best chance screwed wide, and Jovetic fluffed his lines from further out, and the first half failed to see a shot on target from the Mighty Champions. Unlike Everton. A fine move that saw Lukaku outmanoeuvre a ponderous (he’s also very, very slow….) Mangala and slap a shot in that Hart did well to save and then was beaten all ends up by Coleman (remember him? Our goalscoring full back?) on the rebound only to see the ball crash against the crossbar. In fairness, that was about it, we weren’t exactly prolific ourselves, but what we were was under the tag “growing in confidence”. The men I think helped make that happen were 5 in number and deserve special mention, 4 you might expect, and 1 who might make you choke on your cornflakes/scone/roast chicken, depending what time of day you read this. In the interests of health and safety, let’s get the potential choking hazard out of the way first. You’ve been warned. Chew it properly. Swallow (stop sniggering at the back). Put down that cup of tea. Yes, credit needs to go to Joel Robles. I know, funny thing life isn’t it? Who’d have thought I’d ever write that sentence? Well, ok, let’s caveat it by saying he still doesn’t exactly inspire me with confidence, but apart from one very dodgy punch that had a downward trajectory and was more of a pass to a City player on the edge of the box (yeh, apart from that), oh yes, and a pass from his own box in the first 5 mins straight to a light blue shirt that had me checking to see if Distin was on the pitch (yeh, and apart from that), the lad did pretty well. In truth, he had precious little to do. City don’t lump many balls in to the box from the wide areas (or rather they didn’t yesterday, perhaps missing Milner) so Flappy Dappy wasn’t much in evidence, and their corners weren’t much to worry our usually hesitant defence, and as I’ve said, shots on target were at a premium, so he won’t be looking back on a game thinking how many of those goals could I have saved, he’ll be thinking, yes, I’m the man (or more likely, “si, yo soy el hombre”). Whether it’s the knowledge that he’s between the sticks for a good period because of Timbo’s injury, or because we’ve not seen the best of him when he’s only ever had one game to prove himself and he’s been trying too hard, whatever it is, he’s not been the liability we had feared. Still, buy a goalkeeper Roberto in January please. Young John Stones (that’s his full name) was immense. There was a lump in the City back four that they’d paid £32m for, so what price for John Stones that our friends at the Mirror will be trying to sell for us? Mangala may be big, but he was out jumped, out run and out fought by Lukaku, in a way that Stones was never bossed, albeit he didn’t have a centre forward to mark in the same way. Stones just oozes class, he has time on the ball, he can play a pass, he’s got good recovery pace, and he can tackle. He’s still got a lot to learn, he’s only 20 for God’s sake, but a sustained period alongside Jags will help that process. Cynics will now interject and suggest Jags will teach him what not to do, but lay off Jags, he’s having a bit of a ‘mare at the moment, and he needs our support not our hearts in our mouths. Besic, it says, “likes a tackle”. Not half he does. He was another contender for MotM for me, all over the place, harrying wherever he could, making himself available, never shirking a big tackle, none more so than on Silva in the box. The lad clearly plays without fear, and as even Joey Mad Dog Barton testifies, his intensity frightens many a supposed hard man in the opposing ranks. He plays differently to McCarthy, but when Ginger Jim is available, I wonder if we’ll see him, Besic and Barry in the same side? It could work – Besic breaking up play/legs further up the pitch, quick to exploit the defensive errors, perhaps making a 4-3-3 a real possibility? I think Roberto will worry about McCarthy and Besic together, without the authority and discipline that Barry usually offers. Usually. Enough on that, another day’s debate. Anyway, well done Mo Besic, a lad with 18 appearances already in his first season, and a Blues cult-hero already. The fourth name to single out for applause is Lukaku. In his last two games, he has confounded his critics with better hold up play, more aggression in the air, taking on defenders, and still with an eye to the goal, two of which he could have had yesterday but for the excellence of Hart. The quicker ball to Lukaku has helped play to his strengths, the ball down the side for him to use his speed not just his considerable strength (the way he ran around Mangala and gave him a 10 yard start yesterday was priceless, but I might have mentioned before that I think Mangala is a tad slow) is clearly paying dividends. He look lively, alert, and judging by his celebrations when he scores (West Ham) or his mate Naisy does, it clearly matters to him. 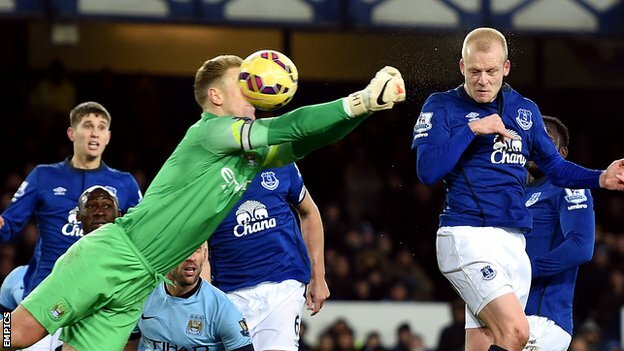 Naismith got given Man of the Match officially yesterday by Sharpy, and by many other observers. The reality is that THE man of the match was Silva, but for me Stones was our man, based on what he did and what he stands for, as well as doing it amongst the leakiest back four we’ve had a in a while. But no matter who gets the Champers, the reality is that Naisy was fantastic yesterday, and not just because of his well-taken goal. He runs around the pitch, predominantly in the opposition half, but is no stranger to tracking back and helping full backs, and is a man you’ll want in the air at set pieces in to our box. He’ll have more to do on that score on Tuesday no doubt, but yesterday he made sure that the City back four, plus the Ferny brothers, got no time to settle at all with his constant closing down. But he’s not just an Andy Johnson-type, defending from up top. He links play, he creates space well for himself and those around him, and once in the box, he’s almost certain to get a shot or a header on target (cue a Barlow-spell of no goals and balloons over the bar). He’s an Everton-type player, and a bloody good one at that, and he has proven to us what he’s capable of, and I for one wholeheartedly apologise for suggesting last season that he was Championship level at best. He isn’t, he’s a very, very good player, and a fine asset at the Club, both on and off the pitch. Enough. All these positives are making my head spin. Another day for the limitations of McGeady, who still has much to prove, another day to lambast the Barkley-Botherers who think a lad of his age and maturity should be playing like Silva, a man 8 years his senior, and another day to wonder what exactly has happened to Seamus Coleman. If the Mirror is right, I won’t have to bother with the last one, but he does appear low on confidence, his gung-ho attacking seems to have deserted him, and his ability to lose control of a ball and run it in to touch is just a tad worrying. And another day to wonder why Barry has gone off the simmer since his injury spell. It’s about positives for now. We had a good day out yesterday – lots more now please Everton, no questions asked.